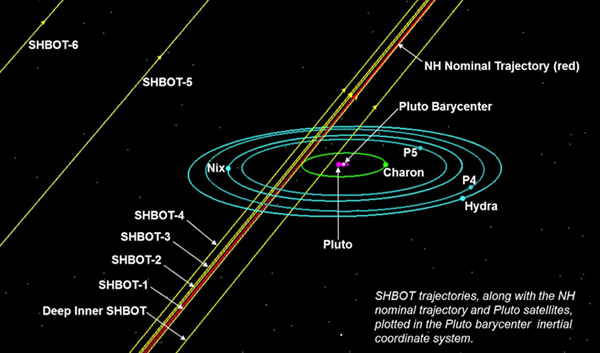 The New Horizons team studied numerous alternate flybys, called SHBOTs, before recommending to NASA a pair of backups to protect New Horizons from possible impact hazards in the Pluto system. All exploration comes with both rewards and risks. Back in 2005 and 2006, when Pluto’s second and third moons (Nix and Hydra) were discovered, searches by astronomers for still more moons didn’t reveal any. So the accidental discovery of Pluto’s fourth moon by the Hubble Space Telescope in mid-2011 (during a search for Plutonian rings) raised the possibility that the hazards in the Pluto system might be greater than previously anticipated. Those concerns were amplified when Hubble discovered a fifth moon in 2012. As a result of those discoveries, the New Horizons science and operations teams began to more carefully scrutinize the true level of hazards to our spacecraft at closest approach and devise mitigation strategies to make sure the encounter with Pluto would be successful. New Horizons benefits from its approach trajectory because that trajectory is steeply inclined to Pluto’s satellite plane and associated debris hazards that models show should lie close to the satellite plane. As a result, most of the risk New Horizons faces occurs only at closest approach, when the spacecraft is very near the satellite plane. 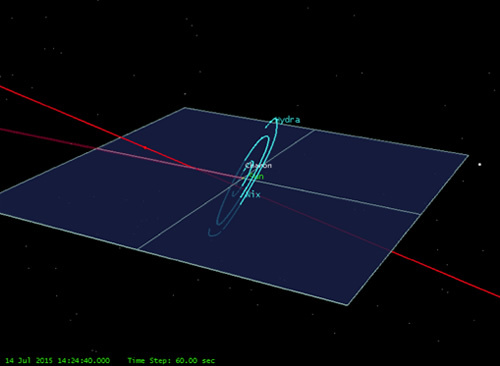 The New Horizons trajectory (red line) is steeply inclined to Pluto’s satellite plane, thereby restricting satellite debris hazards – which lie near the satellite plane – to the short time near closest approach. The Pluto system appears to be far safer than early fears and initial calculations indicated when the new moons began popping up. In fact, the best current models predict a 0.3% (1-in-300) chance of a mission-ending impact near closest approach on the nominal trajectory. Much of the reason for this lowered risk assessment is that more sophisticated dust-impact models revealed a decrease (by about a factor of 100) in lethal impact probability for trajectories that fly into the region where New Horizons is aimed now – a region where the gravitational effects of Pluto’s largest moon Charon clear debris. Another important factor is that when we tested spacecraft components against high-velocity impacts using gun ranges in New Mexico and Ohio, we found the spacecraft shielding is considerably “harder”– that is, more resistant to impacts – than preflight estimates indicated. The baselined New Horizons closest-approach aim point is one of the safest possible aim points – if not the safest aim point – in the Pluto system. This is because we’re headed to a closest approach in the region that Pluto’s Texas-sized moon Charon efficiently clears of debris. In fact, Charon offers such a good hazard-removal service that even if a recent impact onto a small moon created debris near Charon’s orbit just months before encounter, Charon would clear almost all of it by the time the spacecraft arrives. Thanks to these three findings, we’re much more confident that unless something new and unexpected comes up between now and encounter, our current plan, which has been optimized to maximize the encounter science return, is to the best level of current knowledge, safe. But to be still more prudent, we’re also implementing plans during the final weeks of approach in summer 2015 for New Horizons itself to search for hazards that we can’t see from Hubble or Earth-based telescopes. And we’ve also added “fail safe” data downlinks just two days and one day before the encounter to send home the best images and spectra stored on the spacecraft’s recorders, just in case our current estimates are wrong and we do lose New Horizons at closest approach. It’s always better to plan this way, just as the Apollo astronauts collected contingency samples right after stepping onto the moon in case they had to make a hurried getaway before their moonwalks could be completed. And – just as every space shuttle mission included (but never used) plans to land after just one orbit of Earth if the spacecraft wasn’t healthy enough to continue – we are also prudently planning two alternate encounter sequences that we can upload to New Horizons as late as 10 days before closest approach, in the unlikely event that our hazard observations on final approach raise new cautions.